(CNN) -- After a group of Israeli farmers sought last year to expand their property in the hills near Jerusalem, they discovered an archeological gem beneath the dirt. Modern Israeli farmers were first to unearth this temple from the fifth or sixth century. A team led by Daniel Ein Mor barely had to scratch the surface before finding the remains of a Byzantine monastery, he told CNN on Wednesday. "The excavation at Nes-Harim supplements our knowledge about the nature of the Christian-Byzantine settlement in the rural areas between the main cities in this part of the country during the Byzantine period," including Jerusalem, Mor said. The church is believed to have been built in the late fifth or sixth century, and is decorated with "breathtakingly beautiful mosaics," according to a description from the Israel Antiquities Authority, which hired Mor. He said studying coins and pottery pieces will help determine the church's age more accurately. Other monastic sites have been excavated in the region, which was part of the Byzantine Empire. For Mor, who is studying for a master's degree at the Institute of Archeology in Jerusalem, the excavation was a great opportunity because he already had been surveying nearby cliffs to document Byzantine monastic settlements where residents were cave-dwellers, he told CNN. "So for me, it was fascinating," he said, referring to the excavation. "It was very close to what I had been working on." The excavation site, surrounded by oak trees and farming terraces, is near Moshav Nes-Harim, 5 miles (8 kilometers) west of Jerusalem. The digging began in November and is being done in phases, Mor said. "Prior to the excavation, we discerned unusually large quantities of pottery shards from the Byzantine period and thousands of mosaic tesserae" scattered on the ground, he said. The digging has been shallow, he said -- reaching only about 7 feet (2 meters) deep. The highest preserved wall is only 4 feet (1.2 meters high). This is common, according to Mor, because over the centuries such monasteries have been plundered and their building stones reused. The digging seems to mark the center of the site, which covers about 15 dunams, or four acres, along the slope of a spur that descends toward Nahal Dolev, according to Mor. During the first few weeks, the team exposed the church's narthex, the broad entrance at the front of the church, whose floor is covered with colorful mosaics in geometric patterns, he said. 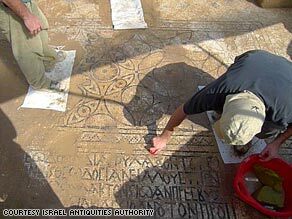 "Unfortunately, at the conclusion of the excavation this mosaic was defaced and almost completely destroyed by unknown vandals," Mor said. In the second phase of digging, the team discovered the apse -- the curved area at the end of the church, behind the choir -- the nave, parts of an aisle and two rooms on the north and south. In the southern room, which has a mosaic floor decorated with concentric circles, the mosaics spell out a dedicatory inscription, Mor said. It says, "O Lord God of Saint Theodorus, protect Antonius and Theodosia the illustres, Theophylactus and John the priest" and asks the Lord to remember Mary and John ... and have pity on Stephen." The excavators also partly exposed a complex wine press, said Mor. Grapes grow well in the region, and it's likely the monks sold the wine. After the church was no longer used for religious purposes, it was abandoned, then likely used for light industry by a non-Christian population, who removed many of the mosaics, and stones from the walls. There are indications that stones were burned to extract lime, Mor said. He said a kiln was found near the church, and Muslim pottery has been found at the site. The team has exposed only about one-third of the monastery, and there are discussions over whether to continue, Mor said. "We are considering finishing and opening the site to the public, but don't know for sure," he said.